The technology of spintronics is based on the intrinsic spin of electrons. In the medium term, it is set to replace electronics as the basis for technical devices. DESY scientist Lars Bocklage has discovered a new way of producing ultrafast spin currents. His calculations, which have now been published in the Physical Review Letters, suggest that the spin current can operate at terahertz frequencies – a thousand times faster than the speeds achievable at the moment. Such conventional electronics could be replaced by spintronics in the long term. Spin is a quantum mechanical property of the electron and a measure of its intrinsic angular momentum. Like the electrical charge of an electron in electronics, its spin can also be used to process or store information. This field of research is known as spintronics, in analogy to electronics. Spintronic devices are already being used today for the read heads of hard disks and for magnetoresistive sensors. However, spinelectronics is a pure nanotechnology, because spin currents only travel extremely short distances before losing the information they carry. 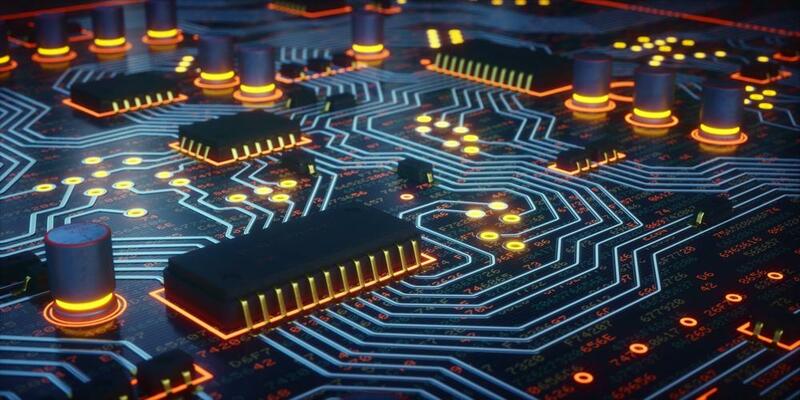 Nevertheless, spintronics could one day replace electronics altogether and process signals not only extremely quickly but also very energy-efficiently. This is because, in contrast to electronics, no electrons have to flow as a current in spintronics, producing waste heat and thereby consuming energy. Like electrical currents, spin currents can be created by fluctuating magnetic fields. 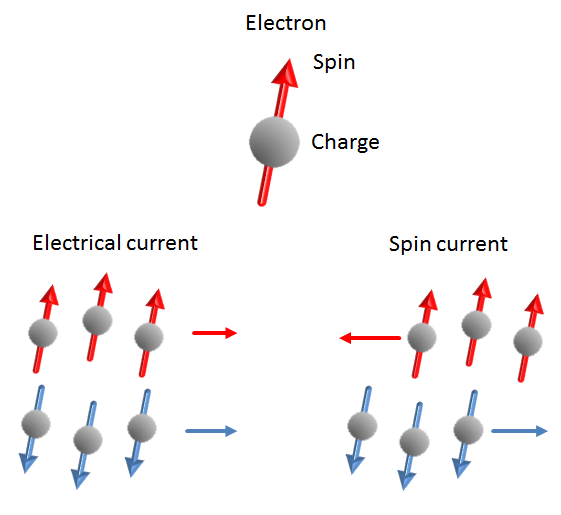 A spin current can also be “pumped” from a magnetic material into a neighbouring non-magnetic material; the spin current then also exists inside the other material for some distance. The effect is particularly pronounced when the magnetic material is excited by an external magnetic field at its resonant frequency. This typically lies around a few gigahertz, the frequency at which modern-day mobile communication devices or computer processors are operated. A gigahertz (GHz) corresponds to one billion oscillations per second, a terahertz (THz) is a thousand times faster, i.e. one trillion oscillations per second. An electron carries a negative charge and a spin (upper picture). The spin can point in two different direction either up (red) or down (blue). Electrical currents transport charges (lower left). The spin directions cancel each other and only charges are transported by the electrical current. Spin currents transport spins. 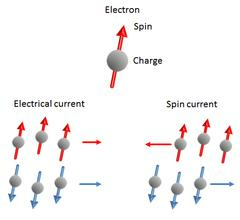 For a spin current (lower right) the electrons with different spin directions move in different directions. The charges cancel and only spins are transported. (picture: L. Bocklage). Bocklage’s calculations show that ultrafast spin currents can be produced at one thousand times higher frequencies than has hitherto be possible. Surprisingly, the spin current does not drop to zero, even when the excitation is not driven at the resonant frequency. “The rapid temporal fluctuation in the magnetisation compensates for the decrease in the amplitude of the magnetisation,” explains Bocklage. “This leads to a sustained spin current at very high frequencies, which stabilises at around ten percent of the resonant frequency current. By exciting it using terahertz radiation, as is now used by full-body scanners at airports and for which intense sources are currently being developed in modern-day laser research, the THz spin current can be even greater.” Another advantage is that the terahertz spin current oscillates in unison with the magnetic field that stimulates the magnetisation. This means that the spin current can be fully controlled externally via the THz magnetic field.